Gifty turned on her Instagram with a shade for Alex and Chioma, over ‘disappearing on Instagram’ and the ‘assurance gift’ respectively. 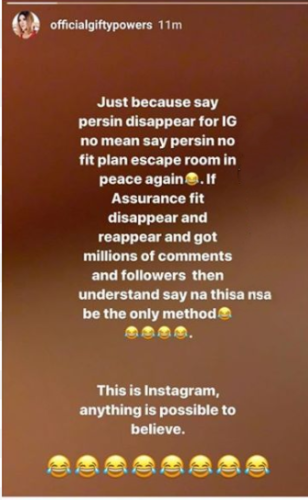 Recall we reported that Alex deactivated her Instagram account, few days after the Big Brother Naija Reunion show was concluded. Though why Alex deactivated her Instagram account is yet to be revealed, however it should be noted that this decision came after she amassed over 1 million followers on the platform. A quick check on Naomi Adenuga, her manager’s Instagram and Twitter account, revealed that no statement explaining the decision behind the move was passed on. We also reported that Chioma deactivated her Instagram account, shortly after Davido’s birthday. She was kept hidden for a while until Davido made her public after he dedicated a song, “Assurance” to her, and even bought her a brand new Porsche. 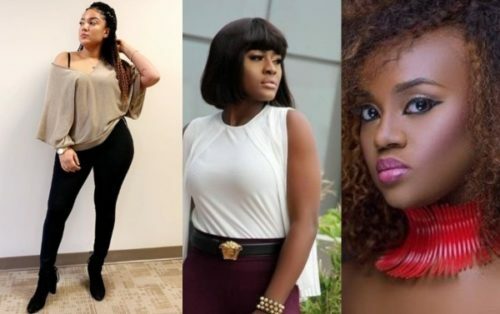 Since then, Chioma was quite exposed to the Social media world, and we saw more of her on Social media.. Her Instagram page even skyrocketed with thousands of new followers following her account. She also bagged a multi-million endorsement for a cooking show.